With its Ultra-Short Throw lens the XJ-UT351WN can project brilliant, shadow – free images up to 100” diagonal. The builtin short throw lens and advanced mirror system provides an extremely close throw ratio (0.28:1) and enables you to project an 80” image from just 1.5 feet away. The XJ-UT351WN’s advanced LampFree® light source combined with the Ultra-Short Throw lens system produces 3500 lumens of brightness and boast WXGA (1280 x 800) resolution which is ideal for displaying HD content from video and computer sources. The 16:10 widescreen aspect ratio ensures your content is viewed without distortion. 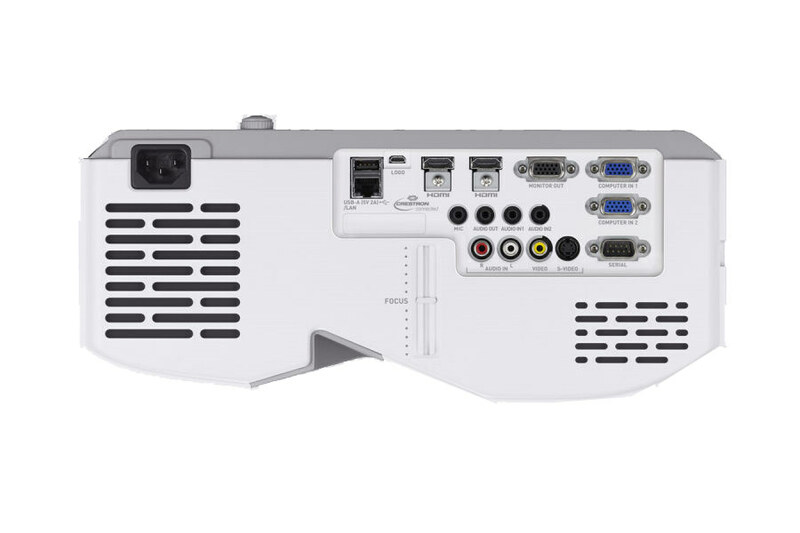 The XJ-UT351WN boasts a full suite of inputs including, Video, Computer and two HDMI terminals with audio. It is equipped with a powerful 16 watt speaker and a dedicated dynamic microphone input ensures everyone can hear. Network (RJ-45) and local RS-232 connections provide control and remote status monitoring capabilities while close captioning used in conjunction with Crestron RoomView® allow direct email alerts and much more. There is even 2GB of built-in memory storage for direct playback and viewing with the need for additional equipment. A CASIO App is also available and enables wireless connection and interaction with mobile devices. Using CASIO’s free mobile application – compatible with both Apple and Android – educators can easily integrate technology into the classroom. The mobile application allows educators to display and annotate presentations from a mobile device, as well as capture and save their work. In addition, educators can open an Internet browser and display content in real-time. There is also an image capture function using the mobile device’s camera to snap an image and send it to the projector. Hybrid light sources means an increased color range with projectors showing approximately 50% more of the spectrum for accurate renditions, subtle shadings and brighter images. * software may not be included, call sales to check. Do You Need a Spare / Backup lamp? Lamps can blow, if you need your projector working and can't afford down time, you may need to keep a spare lamp. The replacement projector lamp for the Casio XJ-UT351wn is the No Replacement.